STAMFORD, CT (June 4, 2013, 2013) Today, Mark My Media, a firm which produces league tables for the financial services industry, announced the creation of a new recruiting database, allowing finance industry employers access to the profiles of top candidates in the United States. This database is the first of its kind, populated with recent graduates and students currently enrolled in college and graduate programs, and providing users a way to search for talent based on skills that have been tested in live market conditions. The candidates in the recruiting database are top performers in the 2012-2013 Institutional Investor All-America Student Analyst Competition; a program for undergraduate and graduate students in finance to test their mettle against like-minded participants from around the United States to develop the best simulated stock portfolio. 700 students from 35 colleges and universities competed and the winners were published in Institutional Investor Magazine’s May 2013 edition. Performance was graded quantitatively on multiple factors to determine the winners in seven different industry sectors as well as in a general category. Now, the database allows these vetted and financially experienced students an opportunity to searched and contacted by The Wall Street firms in search of top performers. In the competition, Schools whose students performed particularly well included a number of MBA programs from well-known financial schools such as UC Berkeley’s Haas School, Cornell University’s Johnson School and Fordham’s Gabelli School. Undergraduate programs that stood out included CUNY/Baruch’s Zicklin School, Drexel University and University of Texas at Austin’s McCombs School. Schools such as Florida International University and Loyola Marymount University were well-represented by students from both undergraduate and graduate programs. The candidates used a wide variety of strategies, including fundamental analysis of individual companies, technical analysis, algorithmic models, and macro strategies that were executed through the use of ETFs. The competition was powered by Mark My Media’s ALPHASEAL® investing platform; a cloud-based simulator that provides each trader with a personal portfolio, tracking the equity value, the net asset value, and profits and losses on a daily basis and imposing the same mark-to-market discipline that Wall Street and money management firms use to measure performance. By tracking their own performance, students at colleges large and small can provide would-be employers with an objective measurement of their investment acumen. 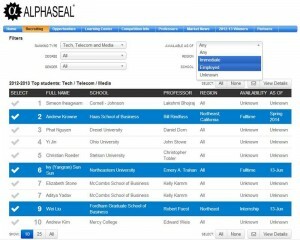 Jason Tong, who was the #3 ranked analyst in the Energy, Power and Utilities sector, said: “Alphaseal provided an exciting experience to compete with other students all around the country while I was a senior at Baruch. The platform provided feedback mechanisms that helped me to reduce risk, for example by measuring short alpha, which is a metric that’s unavailable in other trading simulators, but commonplace in a professional setting.” Mr. Tong is currently employed as an analyst at JP Morgan. Employers and recruiters will have full transparency into the relevant statistics for all winning competitors, including the details of their winning sector portfolios and their current employment status and availability. Mark My Media, based in Stamford, Connecticut, produces league tables for the financial services industry and has a sophisticated software platform to track portfolios. The company’s ALPHASEAL® offering helps business students bridge the gap between what is taught in the classroom and what is expected on the trading floor by giving them a tool to track stock performance along similar metrics as those used by investment professionals. Mark My Media treats data as a precious asset and allows system-users to warehouse their data on our own hardware, an SAS-70 certified environment accessible via the cloud. For additional information on the company please visit www.markmymedia.com.